Ok, so I'm bending the rules slightly. 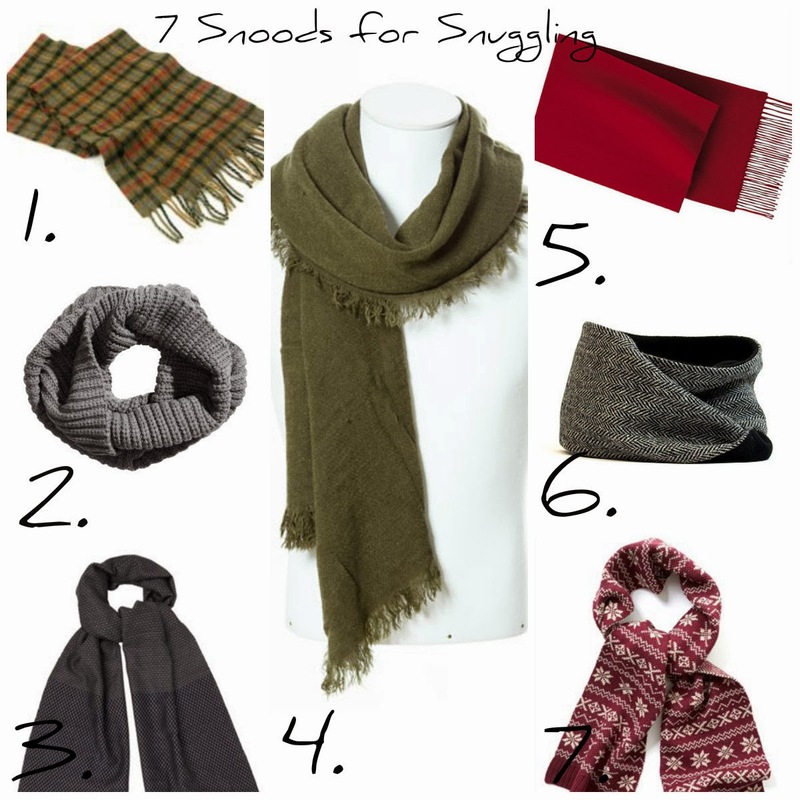 This won't only be about snoods but it's a much better pun! Snoods have seen a massive resurgence in popularity in the past few years; their ease of wear with no fussy knots or loose ends makes them a super stocking filler idea for men. I have an addiction to scarves and our spare room (and attic) has boxes devoted to them; woolly, woven, chunky, fine... you name the occasion, I have a scarf for it. High on my current covet list is a blanket scarf. Not a pashmina or a poncho; but somewhere in between. Heavier than a cotton Afghan scarf but more wearable than the knitted throw from the sofa. Louis Vuitton have one but I do not have anywhere near the budget for such a thing. My search continues! Samuel Windsor Lambswool scarf £25.00 (2 for £40.00): Heritage inspired tartan in lambswool makes a great gift for the outdoorsman. H&M Tube scarf £7.99: Chunky and casual, this will look awesome under a biker or bomber jacket. Jaegar oval weave scarf £60.00 (was £85.00) A smart addition when paired with an over coat, this could be your weapon of choice when leaving the office this winter! Uniqlo cashmere scarf £29.90. Cashmere for under £30.00? Buy it. BUY IT NOW! Harris tweed loop scarf £55.00 I love the use of tweed in a scarf. When a fabric like this is used in an usual way it's always more interesting. Next burgundy Fairisle scarf £16.00 Team with a chunky cardigan or shawl-neck sweater for some apres-ski casual style. Only 7 more days until it's all over. By this time next week we'll have probably unwrapped everything (and decided what's going back) and eaten at least 47% of our body weight in chocolate! Has anything on my countdown caught your eye?